Apparently the Upper Midwest is about to get snow. Like a lot of snow. Like up to two feet in some areas. 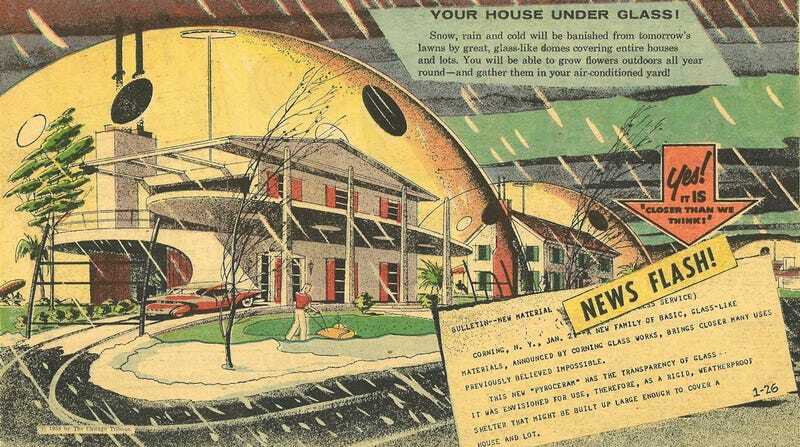 Too bad Americans don't have this domed house from 1958 to shield them from the unofficial start of winter! The January 26, 1958 edition of Arthur Radebaugh's Sunday comic strip "Closer Than We Think" featured this fantastic house under glass. Actually, it was positioned as Your House Under Glass! Because the concept of the strip was about promising that any rugrats reading this midcentury comic would be living with the strip's many futuristic technologies by the time they were adults. "Snow, rain and cold will be banished from tomorrow's lawns by great, glass-like domes covering entire houses and lots," the strip proclaimed. "You will be able to grow flowers outdoors all year round — and gather them in your air-conditioned yard!" People here in the early-21st century might look at a dome like that and immediately think "plastics," but the idea was that it would actually be made of glass. Or at least, brought to you by the glass companies. A new family of basic, glass-like materials, announced by Corning Glass Works, brings closer many uses previously believed impossible. This new "Pyroceram" has the transparency of glass... it was envisioned for use, therefore, as a rigid, weatherproof shelter that might be built up large enough to cover a house and lot. Post-WWII, the rise of plastics in America was starting to put a tiny but noticeable dent in the glass industry. But Big Glass wasn't about to let plastics eat its lunch. It sprang into action and made sure that the people of the 1950s understood the real building material of tomorrow was glass. They wanted to put glass in every product and every piece of newly designed cities to show that it truly was the wave of the future. And even though glass is still an important building material of today, one imagines the domed cities of tomorrow are more likely to be made of something resembling plastic than a substance like glass.